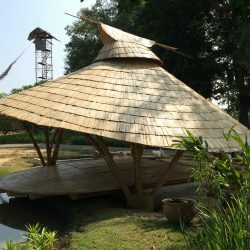 This Bamboo Yoga Sala or pavilion was designed to be used for Yoga seminars in a private compound. 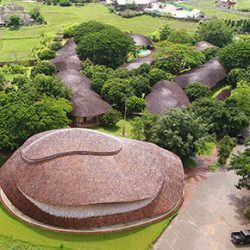 The design brief was to use bamboo architecture to create a space that could accommodate 50 people doing yoga. 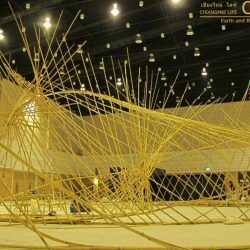 Therefore bamboo arches were chosen as main design and supporting element for the bamboo roof as they create a more spacious, lighter and uplifting feeling than heavier bamboo beams. 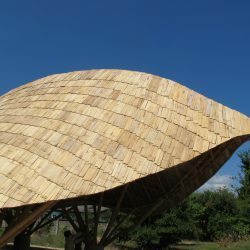 The arches as well as the undulating outer roof rim were made of bundled bamboo beams using a smaller species of bamboo. 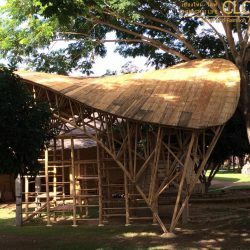 This architecture allows for more usable space as the arches don’t reduce the head space like the diagonal bamboo beams in previous versions of bamboo salas. 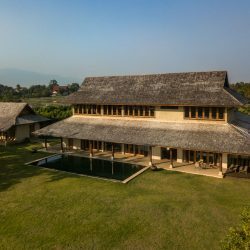 Using the bundles of smaller bamboo culms also gives the whole space a much lighter and finer feeling without compromising structural strength and integrity. Up lights as well as plugs and cables were fitted into bamboo culms or wrapped with natural fibres.